Thank you all for joining in our February LOVE challenge!! The entries were so beautiful and inspiring! We hope you will continue to join us for more fun in the months to come!! #143 Helen from Made by Helen is our winner! Please email Lora to claim your prize. Include "February Winner" as the subject. lora at onecrazystamper dot com. Check back tomorrow for a fabulous new challenge and lots of inspiration! Also I add black to the spots that I want more definition in so feel free to do so..and never be afraid black is your friend!! Have a great day and be safe!! Good morning, crafty friends. 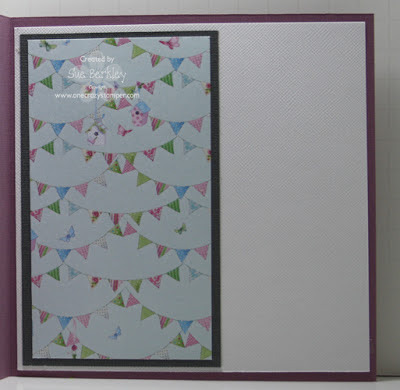 Today I have a quick but picture heavy tutorial on how to make my version of a tri fold card. I tweaked it a lot to make it work for what I wanted it to do. I have a confession to make ~ I had a video tutorial all filmed and was going to post it ~ but two things happened. One, I kept filming my card off the screen so that you couldn't see what I was doing and second, I forgot how to upload my videos. My camera is old and it has always been confusing as to what software supports it and I believe the original program is no longer on my computer. So instead, there are a series of pictures for you to follow. If you have any questions, feel free to leave a comment and your email and I will get back to you with an answer. Step 1: Begin with a piece of base card stock 6 1/2" x 11 3/4"
The reason for 11 3/4" is because I needed the center piece to be 5" across so that I could use my Punch Around the Page punch and have it even. If you have a border die and would prefer to use that to make a fancy edge along the top, you may use a 12" piece of card stock. Step 2: Score as shown in diagram. At 3 1/4" and 8 1/4" and at 2 3/8" along longer edge. Step 3: Cut out rectangles formed by score lines, either by hand or with your trimmer. Punch along upper edge with punch or die. Round corners. Fold on score lines. This is your card base done. Step 4: Cut 3 outside layer pieces as per measurements shown. If you use a 12" card stock you will need to cut the small piece 1/4" larger in both this step and the next. Step 5: Cut 4 inside layer pieces as per measurements shown. If you use a 12" card stock you will need to cut the centre layer 1/4" larger. Don't forget that you only have a couple of days left to enter the challenge theme of Love, here at One Crazy Stamper!!! Every year I try to scrapbook the photos I receive from Christmas cards. This is always a challenge because 1) I don’t do much traditional scrapbooking these days, I mostly digital scrapbook and 2) it’s kind tough putting so many pics on one layout. Even though I don’t love the way it turned out, I love that I have it complete and it can go into our book! I used some papers and wood buttons from the One Crazy Stamper store. Another week has gone by and Sunday is here again. 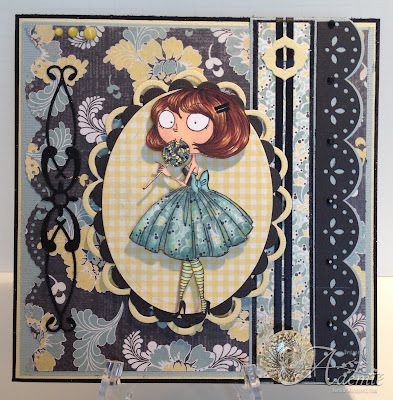 For today's OCS post, I have used this adorable pair called Elle and Elmer from High Hopes January Release. Now I have done two new things. The first, which I have never done before is paper pieced the umbrella using paper from the Lucy Cromwell Design Paper by Papermania. The second which I have done on occassion, is to finish the inside of the card. There are still a few days left to enter this month's "Love" challenge, so get crafty and be creative. March 1st will bring a brand new challenge. While you are at it, have a coffee or tea and take your time checking out Lora's store OCS for the wonderful new products that are arriving. In the meantime, have fun being creative. It's Saturday, and I've got a sweet card to share with you... I used Lola Lollipop from Kraftin Kimmie, Isn't she as sweet as can be? I coloured her with copics and used a prisma pencil for her blush, I then paper pieced her dress(from Authentiques Renew Collection) which was also touched up with copics. 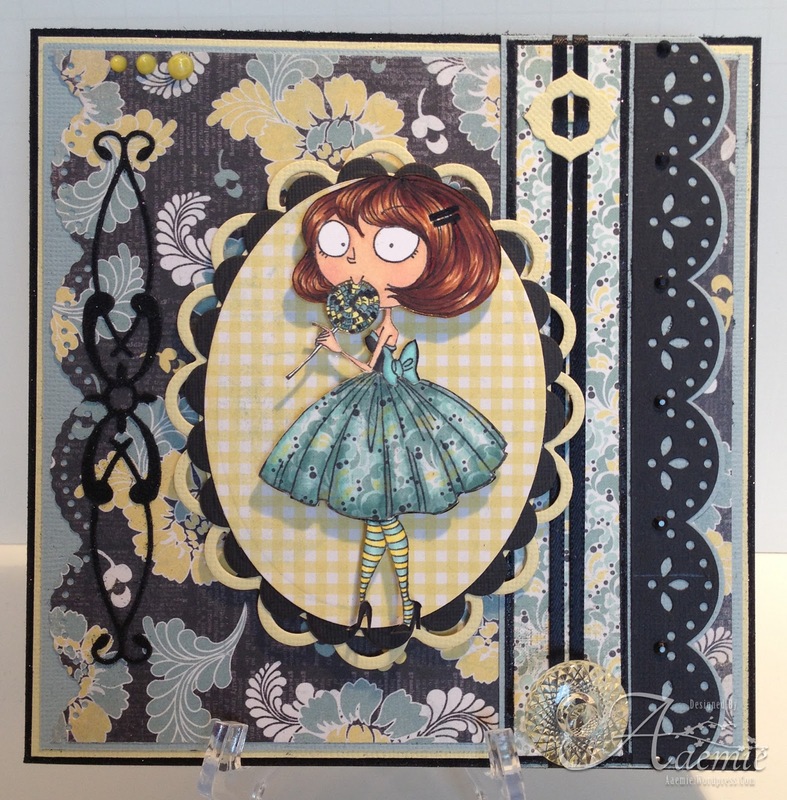 This card is full of die cutting madness, 8 in total! I used some glitter to jazz up the latchette die and also on several other areas. I finished it off with some rhinestones, ribbon and a beautiful button from the Lucile collection. 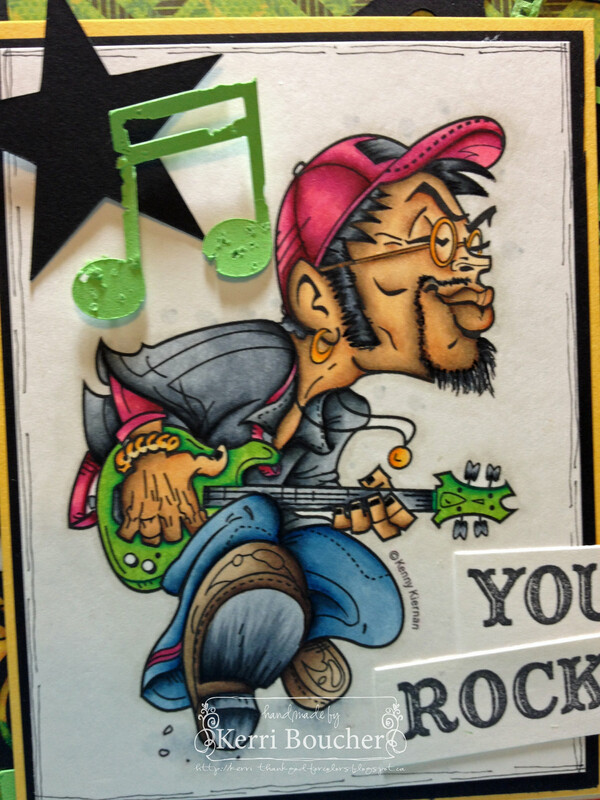 Have an awesome day, and get crafty because there is still time to enter One Crazy Stampers "Love" challenge! You still have time to create and enter into the monthly LOVE challenge, so I wanted to show you the card I made for my Husband for Valentine's Day to maybe inspire you to enter into the challenge. COPIC COLOURS USED: Greys: C5, C3, C1, C00 - Reds: R39, R37, R35, R32 - Pinks: R83, R81, RV10 - Greens: YG67, YG63, YG61. Please feel free to visit my blog or more information on this card. Grass was done by stippling the greens are the same as the can.. The shirt and hat are done by paper piecing.. Shirt Shading PC901 Indigo Blue..
Good day Welcome once again to Wednesday with Heather at One Crazy Stamper. I know I am hoping for Spring but could not help but create a card with the cute little image from Kraftin' Kimmie Stamps called "Snow Day Lucas". Many sets have Lucas in them. And since I now have a grandson I can see him in this little boy. Thanks for coming by today. Don't forget you still have time to enter our LOVEly challenge for the month of February. 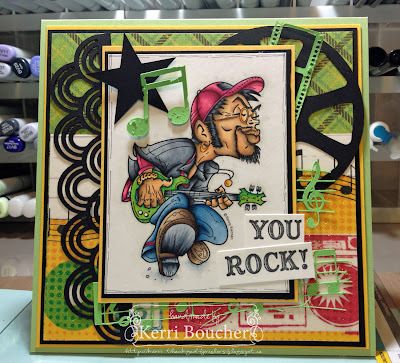 Terrific Tuesday time again here at One Crazy Stamper, and in keeping with this month's theme of Love, I have stamped and colored up this great image from Art Impressions. This is one of the Bird Brains stamps called Dancing Birdie and Scratch, which I colored with Copics, fussy cut and then placed on the card front with an Action Wobble to make them dance, wiggle and jive!!! To create the card front, I randomly rubbed four different colors of distress inks (Aged Mahogany, Barn Door, Spiced Marmalade and Walnut Stain ) across a piece of watercolor paper, then spritzed with water to make the colors blend. After drying the resulting wash with my heat gun, I then stamped the Aged Mahogany ink pad on to my splat mat, then spritzed the color with water to make the ink form into drops. I then placed the original piece of blended colors over top of the droplets of color, to create the blotchy look. To complete the look I stamped the Whimsy Stamps Into the Farm image with Versamark ink, sprinkled with brown embossing powder, and used the heat gun again. The sentiment is from my stash. This would be a great card for an anniversay or special day to celebrate Love. How Cute is this High Hopes Stamp, Henry the Great?! I have loved it ever since it was released a few years ago. 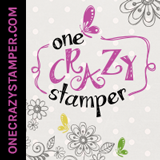 I recently purchased it from the One Crazy Stamper Store and love it. Don’t forget you have a few more days to enter OCS February Challenge which is LOVE and as always there is a great prize up for grabs. As Valentine's Day was Thursday, I couldn't resist colouring this adorable image for my grandchildren called Heart Hugs designed by Crissy Armstrong for Whimsy Stamps. Don't forget that you have to the end of the month to enter OCS challenge which is Love. Do check out Lora's OCS brick and mortar and online store for some amazing sale items and the continuous arrival of new products. Good morning crafty peeps! Today I have a fun image who most of us can relate to, that is the ones who love their copics. Since I didn't have any pink or grey flowers, I used the same copics that were used for my image to colour the flowers to match the card. I also used one of my fav tools (Sew Easy) to stitch on the big hearts in pink thread and of course added some pink bling and pink lace. 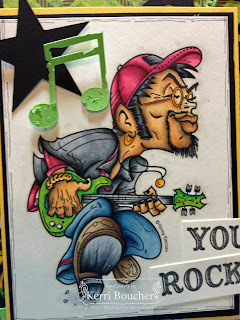 Have a great day and get busy crafting up a creation for One Crazy Stampers "love" challenge. Another week has flown by, it is already FRIDAY! Whoo Hoo! Today I have a card to show you that I made using the "Going Places" stamp set from Kraftin' Kimmie Stamps. 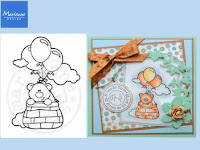 One Crazy Stamper has a large assortment of Kraftin' Kimmie Stamps to choose from that I am sure you will find one you love - be sure to check it out! I hope that you enjoyed today's post, and don’t forget that you have till the end of the month to enter our LOVE challenge for your chance to win a fabulous prize! Good Wednesday morning to you!! I hope this finds you all well and making time to do the things you want to do for yourself like crafting or reading or....well, whatever it is that you do. And, speaking of reading and crafting, my project today combines both of my favourite pastimes. I created this bookmark using an image from My Favorite Things available at One Crazy Stamper. 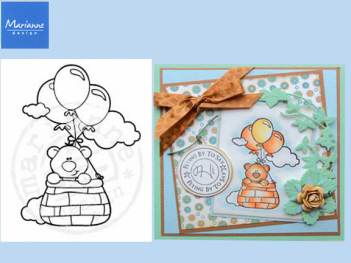 It will be great paired with a card that matches (coming in the future) as a set to give as a gift. Image ~ My Favorite Things "Blue Without You"
Thanks for dropping by. Enjoy your day. I will see you again soon. There is only a couple of days left before Valentine's Day arrives, and I just couldn't resist coloring up this adorable Free Hugs image from Saturated Canary, and making it work as a card for the big day!!! 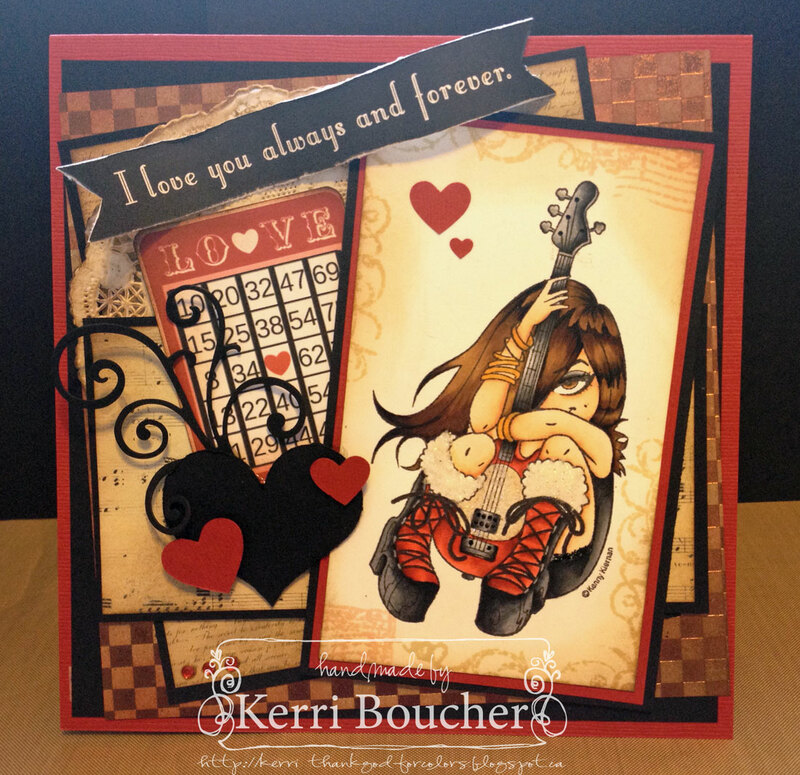 So here's my card for One Crazy Stamper's challenge of Love. After stamping the image on Copic Xpress It cardstock with Memento Tuxedo Black ink, I colored her with Copics. The image was cut with a Spellbinders die and then attached to the card front, which was also cut with a Spellbinder Grand die. 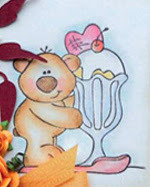 Several heart shaped punchs are used to frame the image, and to compliment the inside of the card. The dp on the inside of the card is from Bo Bunny's Love Letters collection, and the sentiment is an oldie from my stash. A small piece of velcro tape holds the card closed. Did you see our February OCS challenge is LOVE?! Easy right? And as always there is a prize up for grabs. I used this Memory Box Die-Chloe Stem as the main focal point on my card. I LOVE this die as well as the My Favorite things butterfly die I used. As much as I love to color, sometimes I just love making a card without a colored image on it. Especially when there are so many great dies out there! It is Sunday and there doesn't appear to be any snow in the forecast. We have probably had enough of the white stuff since Thursday. For today's post for One Crazy Stamper I have used this adorable stamp from Stampavie called Tickles. There is still plenty of time to enter this month's Love Challenge at OCS. All supplies can be found at both Lora's online and brick and mortar stores One Crazy Stamper. Good morning crafters, today I have a fun love themed card. I used Artemis from Kraftin Kimmie and found the perfect sentiments by Whimsy and just love their ticket dies too, which I spitzed with some Fireworks by Tsokeniko. 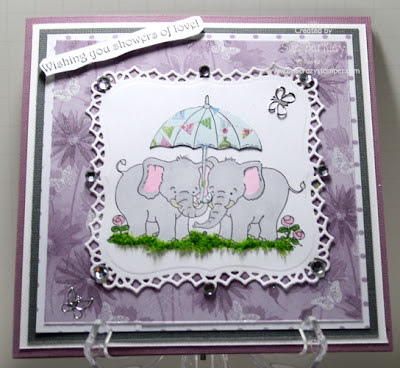 I used a heart embossing folder and heart border die incorporated with a scalloped edge die. I also added some twine and a bit of lace of course because I'm a little obsessed with it lately. I distressed my blue cardstock just by running my nail along the edges and added black soot distress ink on the Love Letters Collection DP. I hope you all enjoyed my creation! 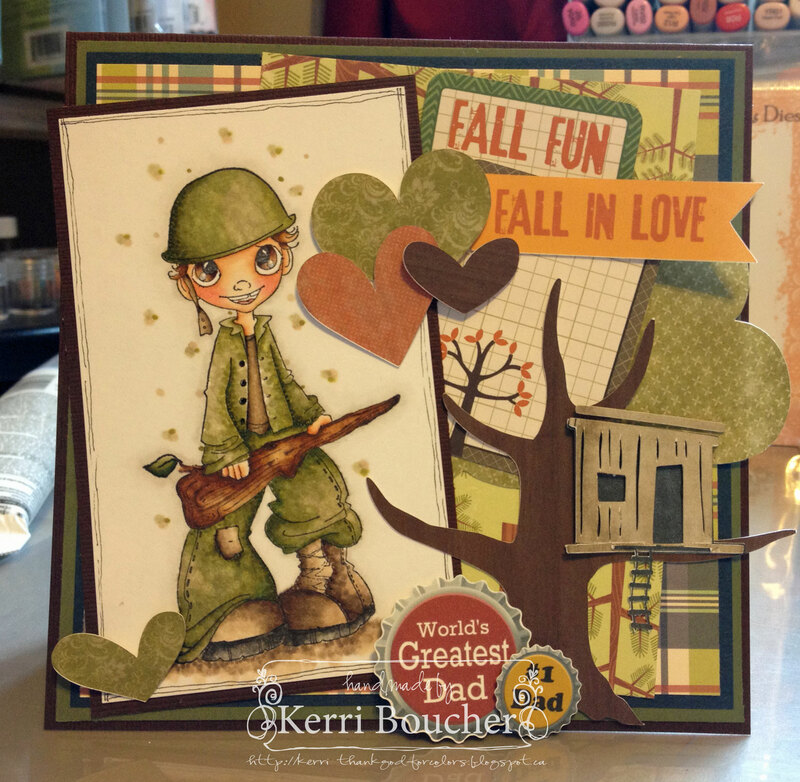 Have a great Saturday and get busy crafting up an entry for our OCS Love Challenge. Hello and happy FRIDAY!!!! I hope that y'all had a fantastic week! OSC Supplies used: Copic Xpress Paper, Copic Markers, Memento Ink: Tuxedo Black & Nautical Blue, Glossy Accents, Sakura Gelly Roll Clear Glaze Pen, Kraftin' Kimmie Stamps: Bami Bubble Gum & High Hopes Stamps: Growing Old sentiment. Copic Colours used: Skin-E11, E00, E000. Hair-E49, E59, E25, E50. Eyes-B99, B95. Lips-R83, RV10. Bubble-RV10. Hat & Top-E47, E44, E43, E42. Shoes & Belt-E44, E43, E42. Cami-R83, R81. Jeans-B99.B97. B95. Gumball Machine-R29, R24, R22, C3, C1, C00. Gumballs-YG09, YG07, R83, R81, R24, R22, B97, B95, Y15, Y13, YR16, YR14. Ground-E42, E41, E40. I hope that you enjoyed today's card and don't forget to enter our monthly Challenge with the theme LOVE, so easy with Valentine's Day just around the corner! First Week of Feb Almost Gone!! Well Hello there!!! First of all thks for stopping by we love to have all of your eyes peering at our creations...Today I have a card for you that I have made for my Hubby for Valentine's Day..For those of you who know me my Hubby is the greatest and I love him to pieces...The image I used is one Lora picked for me and it was not the one I thought and I was not to sure how I was going to colour her up but I got the job done..Her name is Star she is a Kenny Kiernan image and she is from Whimsy Stamps...She was coloured with Copics and very few pencils I think three to be exact...The Pattern Paper is Antique Aged Papers by Bazzill.. All of these supplies can be bought at One Crazy Stamper..
http://www.onecrazystamper.com For more details and a colour list pop over to my blog.. have a great day and be happy!! http://kerri-thankgodforcolors.blogspot.ca Don't forget to play along in the Challenge you can win some great prizes..
Good Morning. My friend and I were talking this weekend and trying to decide what kind of cards we made the most. I discovered that I hardly ever make a birthday card but make plenty of "All Occasion" or "Thinking of You" cards. What type of card do you make the most of? 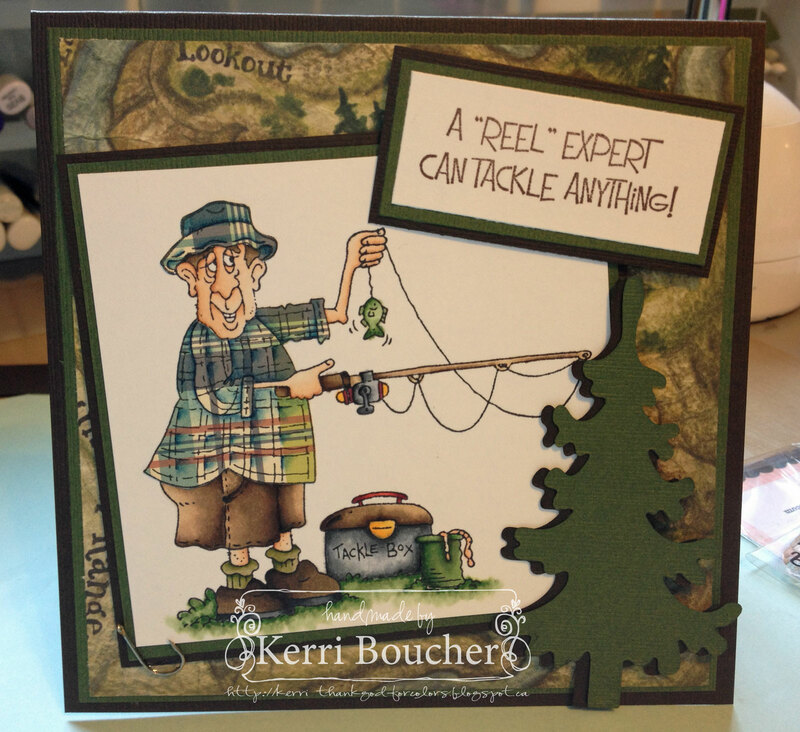 Today's card features one of the cute images from Kraftin Kimmie Stamps "Best Fur-iends. I am a cat person through and through so I just had to use Lexi from this set. Image ~ Kraftin Kimmie Stamps "Best Fur-iends"
Patterned Paper ~ Basic Grey "Soliel"
Drop in to the One Crazy Stamper store and see all the great supplies she has to offer and join our challenge this month where the theme is LOVE. Have a great Wednesday and I will see you next week. Whenever I start to color an image, I always start by choosing my papers, so for this little cutie I choose First Editions Hideaway collection with these bright citrus colors. After the paper is picked, I can then match the Copics for a perfect combination. The sentiment, one of three that are included with the image, was stamped and mounted on a Spellbinder die frame, and the pearls were made with the Viva Decor Salmon Pearl pen. I have a cute and yummy project to show you from our February Guest Designer Kelly Bee. Kelly created this cute treat holder. The chocolate is the icing on the cake. Check out Kelly’s blog for the tutorial on how to make these.